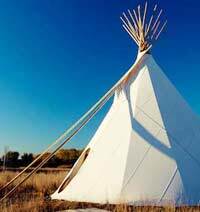 Remember as a kid playing “Cowboys and Indians” and wanting to sleep in a teepee? Well, whether you’re sharing that fun with the family, or just being a big kid at heart, there are places throughout the U.S. where you can do just that. This unique lodging is located in the southwest corner of the state and offers a variety of sleeping choices from vintage trailers to the teepee. They only have one for rent and it is $70/night. This place hosts an annual music festival and is definitely a place to get away from it all. This motel was built around the idea of individual motel rooms in the shape of teepees. 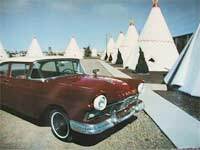 It was one of seven “Wigwam Villages” built along the classic Route 66 and still remains in operation today. The rooms are old, but if you want a true slice of mid-1900s Americana, and want to sleep in a gigantic concrete teepee, this is the place to do it. Rooms will run about $60/night and come with two double beds, showers and cable TV. One of the most popular state parks in Arkansas is Petit Jean, and part of that is probably due to the ability to camp out in a teepee. Ok, I’m sure the gorgeous red bluffs and waterfalls may have something to do with it, too. They have two teepees for rent here at $50/night. 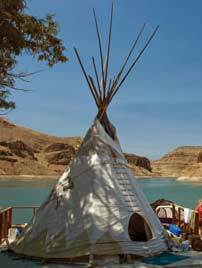 West coasters can take advantage of the teepee rentals at the Lake Owyhee State Park in eastern Oregon. Why bring a regular tent to enjoy a weekend out at the lake when your family can sleep in a teepee? Theirs sleep up to six and rent for $36/night. On the southeastern edge of Tennessee, just outside of the Great Smoky Mountains National Park, sits the Hidden Lake Campground & Resort. 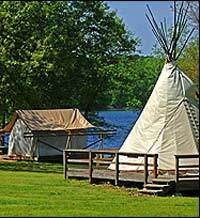 They have two sizes of teepees for rent, a 16-ft diameter ($35/night) and an 18-ft diameter ($45/night).